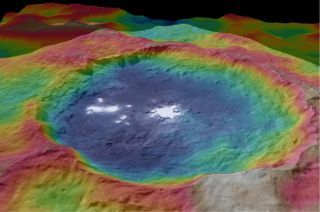 A color-coded topographic map shows Occator crater on Ceres. Image released Sept. 30, 2015. NASA's Dawn spacecraft obtained images for this map-projected view of Ceres during its high-altitude mapping orbit, in August and September 2015. The new Ceres maps are being discussed at the European Planetary Science Conference (EPSC) in Nantes, France, which runs from Sept. 27 through Oct. 2. At EPSC, Dawn team members are also talking about a puzzling observation made by the spacecraft — three bursts of energetic electrons from Ceres that may have been produced by interactions between the dwarf planet and solar radiation, NASA officials said. A color-coded map from NASA's Dawn mission reveals the surface topography of dwarf planet Ceres. Image released Sept. 30, 2015. NASA's Dawn spacecraft provided image used to produce this view of Ceres featuring a tall conical mountain. Image released Sept. 30, 2015.